Ready for an easy recipe? 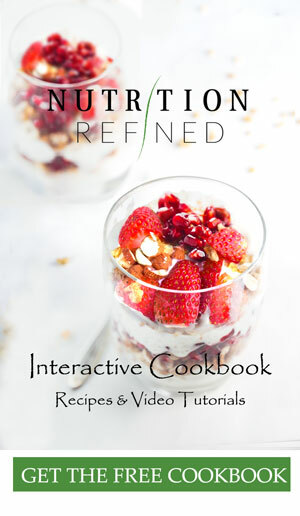 Enter coconut yogurt parfait! It’s creamy, crunchy, and very energizing. Its light enough that you don’t feel weighed down and filling enough that you won’t need to snack right after. I serve it mostly for breakfast, but it’s also great as a snack or even a dessert. I have so many good things to say about yogurt parfaits! They are easy, versatile, and – most importantly – you can trick your children into thinking that they are desserts. True story – it does work with my 3-year old! Something about the fancy presentation makes her think it’s something special. 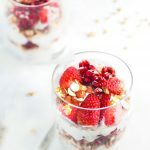 If I wanna make the coconut yogurt parfait really special – like an alternative to the traditional ice cream sundae – I use frozen coconut yogurt. I blend it in my food processor into a soft serve consistency, and then use different toppings to make the parfait look extra pretty. For this parfait, I am obviously using coconut yogurt, but you can use any plant-based yogurt you like. I have now made yogurt from cashews, almonds, macadamia nuts, and it always turns out great! I never make a parfait without fresh fruit. The type of fruit you use is up to you. I used blackberries and strawberries, but use whatever is in season in your area. Sometimes I use just fresh fruit. 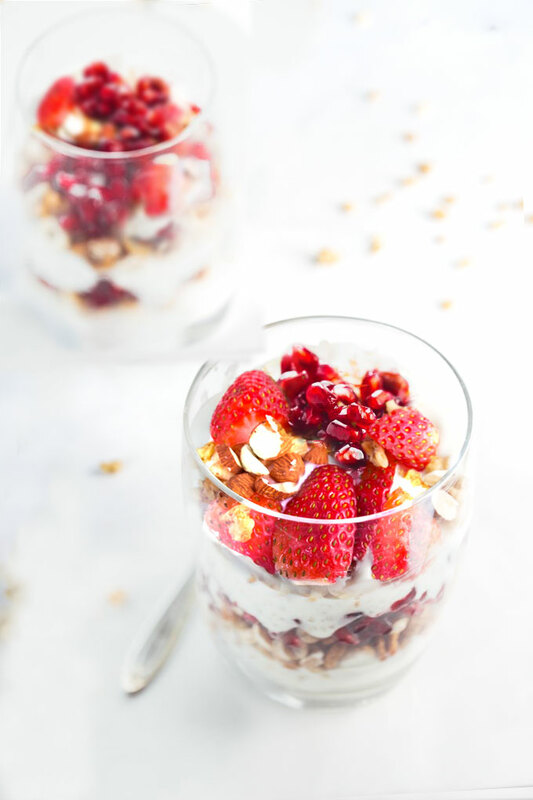 But if I’m serving this coconut yogurt parfait as a dessert, I make it a point to also whip up quick berry sauce (recipe is below). Not only does it look pretty, but it also adds some nice sweetness. When in season, using fresh berries is, of course, better than frozen. There isn’t a wrong way to make a parfait. If I’m making the coconut yogurt parfait for Tanner, I load it with yogurt (and maple syrup because he has a sweet tooth!). If I make it for myself, I add a lot of fruit and A LOT of granola. A great parfait should have at least four generously-sized layers. Start in the bottom of your dish or bowl (clear glass if you want to be traditional). Scoop yogurt into the bottom. Next, pile on the berries and granola. If you’re using a mix of fresh and cooked fruit (e.g. the berry sauce), this is the layer to use the cooked. Follow this layer with another scoop of yogurt and top the entire dish with fresh berries. If you want to be fancy, garnish the top with a bit of granola and any leftover berry sauce. If you’re a perfectionist, or if you’re serving parfaits at a party and want them to look perfect, create one layer at a time, then pop the dish into the freezer for a couple minutes. You’ll set each layer so that they are more precise-looking. 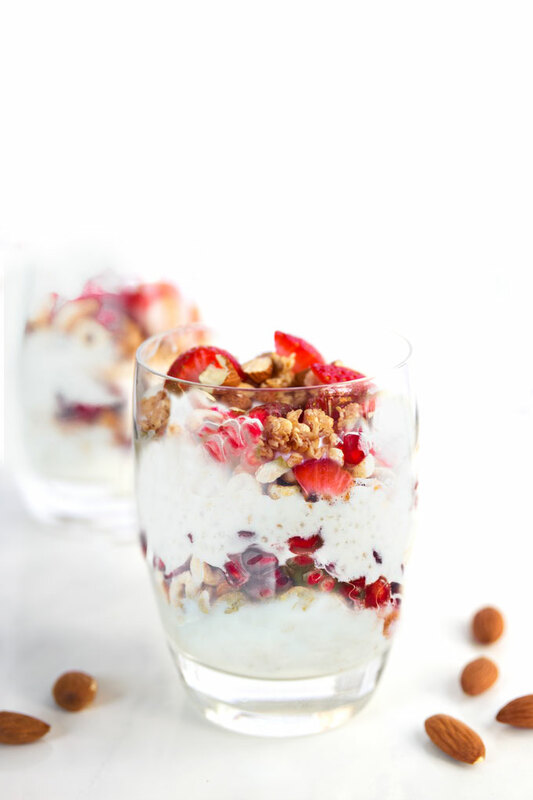 This coconut yogurt parfait consists of homemade coconut yogurt, berry sauce, and grain-free granola. It's creamy, rich, and delicious. Place fruit and juice in a small saucepan and bring to medium heat. Once it starts boiling, use a spoon and start gently mashing some of the fruit (so it releases some of its juices). Continue cooking over medium-low heat for about 10 minutes. Remove from heat and transfer to a clean jar or container to cool thoroughly. Store in the fridge. 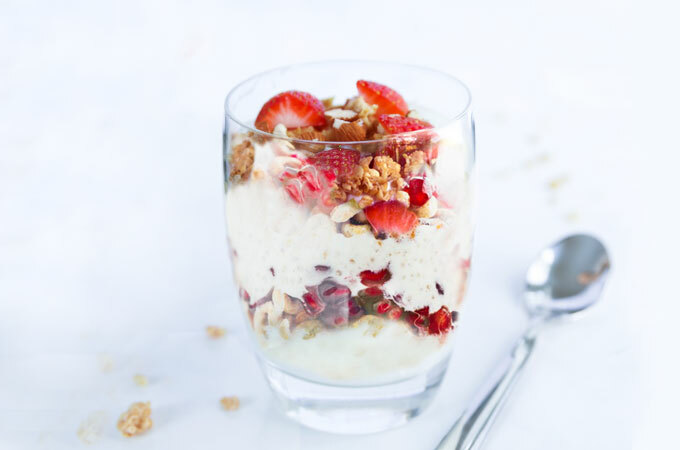 To assemble the parfait, add a layer of yogurt into a glass, then top it with a layer of the berry sauce, and continue alternating these two layers until your glass is full. Then top the yogurt parfait with some fresh fruit and grain-free granola.